Extracurriculars, our work suggests, tend to differ from core classes in a number of important ways. They are voluntary rather than mandatory; they often involve work that is undertaken collectively rather than individually; they feature opportunities for peer leadership and peer-to-peer learning; they involve dimensions of playfulness; and they are aligned to activities that are valued in broader American culture. As a result, these learning spaces take on a sense of purpose and vitality that all too often is missing from normal disciplinary classes. 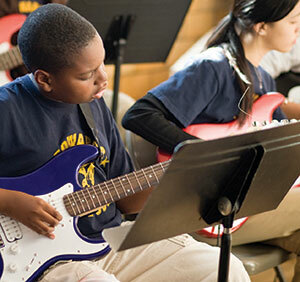 Extracurriculars are also usually well-designed as learning environments. In particular, they allow, and often require, learners to do what Professor David Perkins has called “playing the whole game at a junior level.” For example, participants in a musical theater production have the opportunity to experience the process from soup to nuts: the initial line reading, the blocking, the development of the set design, the back-and-forth between directors and actors, and, ultimately, the integration of these elements in a final performance. By contrast, core disciplinary classes rarely afford students a glimpse into the domains to which they are connected. Science students, for example, often do not see how new scientific knowledge is produced unless they work in a laboratory during college or graduate school. Part of why the extracurricular mode is so powerful is that it draws from the tradition of apprenticeship learning. Unlike in most disciplinary subjects, adults who lead these activities frequently continue to be involved as participants as well as teachers — they play in adult soccer leagues, act in community theaters. This serves to deepen their understandings and commitments, as well as to keep their perspectives fresh. Finally, extracurriculars draw together opposing virtues that are critical for sustained and deep learning: passion because students have chosen the arena and are seeking to excel in it, and precision because there are ample opportunities for practice and feedback. Once we began to see this world this way, we realized that the most powerful core disciplinary classes that we observed shared many of these characteristics. The teachers in these classes are less interested in covering con-tent and more interested in helping students learn how to think in the mode of the domain; they enact a “cognitive apprenticeship” model that echoes what happens in extracurriculars. They foster ownership by organizing the learning around the production of something that is authentic and high quality. Once students have a sense of purpose, teachers build in the more prosaic aspects of learning; writing a letter to a city councilwoman is an occasion to learn how to craft an introductory paragraph much as an upcoming basketball game motivates layup drills. These classes also frequently involve a real (if bounded) element of choice; students need to produce an essay or documentary film that accomplishes certain academic objectives, but they can choose the topic that interests them. Finally, and perhaps most importantly, the ethos of these classrooms is similar to what one might find at an athletic practice or theater rehearsal — an ethos that combines playfulness with purposefulness, drawing together the warm virtue of passion and interest with the cooler virtues of intellectual demand. There is much to be learned from these “extras”; they illuminate some of the most important qualities that characterize powerful learning environments. Strong teachers already incorporate some of these features into their classes; if this became the rule and not the exception, perhaps students would be as excited for what happens during the school day as they are for what happens after the final bell. Jal Mehta is an associate professor at the Ed School and Sarah Fine, Ed.M. '13, is a doctoal student. For more: Read the feature, "Bored Out of Their Minds"